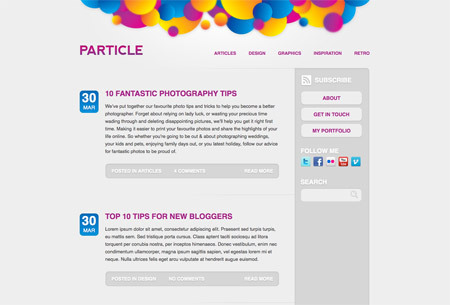 Particle is the latest of a series of WordPress themes available only to Access All Areas members. The design features a clean grey background, with splashes of vibrant colour in the header and throughout the page as links and buttons. Overall the design has plenty of clean lines, and uses subtle shadows and inset text effects to add that touch of style. 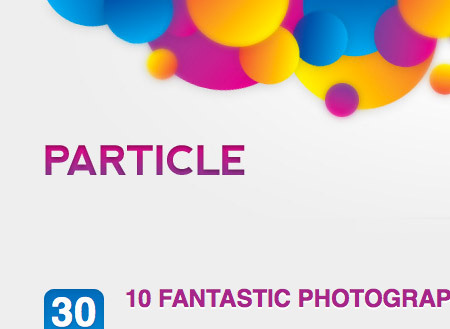 Particle gets its name from the array of circular objects floating around the header of the design. Depth of field effects give various levels of focus, adding a touch of depth to the design. The whole colour scheme of the site is taken from the bright and vibrant mix of pink, yellow and blue in the header, with these swatches reappearing as link states and page headings. Some CSS3 tweaks here and there add extra levels of detail for modern browsers, such as inset text effects and soft shadows. The vibrant colours of the header illustration make Particle well suited to the creative industries, but is generic enough to be used as a base for blogs of any topic. ohh, that looks a really great theme, as you said its simple enough to use for all sorts of blogs, which really makes it tempting to sign up… damn it lol! Thanks its a great theme and great inspiration to! This looks great. I like how simple and clean it is. Looks like it could be used for a variety of things just by changing small aspects. I’m looking forward to playing with it. Great header design. Not sure about the purple headers. Really nice mate, love the cleaness of it. …and thats for all the advice, much appreciated! I’ll keep you updated! Beautiful theme! Simple, yet has a sophisticated feel. Well done! I really like how the color is just enough to contrast the “greyish-blue” background. Good palette. I am downloading the source. I am interested to see how you divided post types to the various pages. I love simple websites. When done correctly, they can stand out from the crowd compared to the blog designs around at the moment. Thanks for the kind comments everyone, I hope the theme comes in handy. 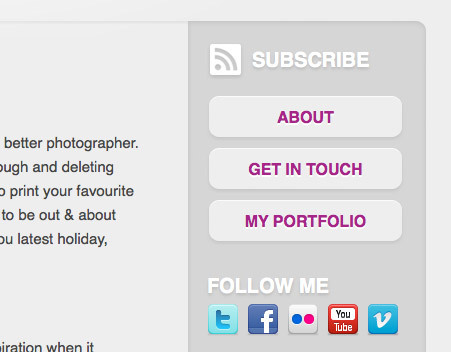 This is a nice example of a neat and clutter free blog! This is something that’s get readers to reading almost every entries of the site. 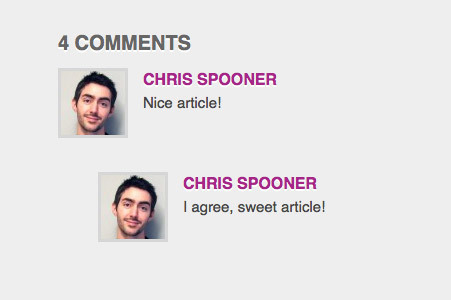 Cool theme chris! :) Keep up the good work.. I like your your wordpress theme its realy great design! Congratulations Chris..